Volkswagen Philippines recently turned over to CW Home Depot 4 units of Santana subcompact sedans that the pioneering home construction and renovation store will issue to its top sales performers. CW Home Depot is the first store-within-store retail concept wherein everything one needs to build or renovate a home is all under one roof. The store’s unique platform offers a variety of building, finishing and furnishing products in a one-stop-shop setup. CW Home Depot’s unique brand proposition for its customers, which revolves around the convenience, practicality, and efficiency of its retail concept, is perfectly aligned with its choice of the Volkswagen Santana as the vehicle for its top sales representatives, who tirelessly do the rounds of client calls and sales meetings with architects, builders, contractors, engineers, interior designers, and DIYers in promoting the practicality, quality, reliability and convenience of CW Home Depot’s products. With the Volkswagen Santana, CW Home Depot’s sales representatives also get to experience the same core characteristics in their service vehicles. The Santana is the most affordable European car available in the market powered by an efficient 1.4-liter Multi-Point Injection (MPI) 4-cylinder gasoline engine mated to a 5-speed manual transmission, with maximum power output of 90 horsepower at 5,500 rpm and maximum torque of 132 Nm at 3,800 rpm. For passenger comfort, the Santana features power outer mirrors, keyless entry and the longest wheelbase in its class, translating to more space for you and the family. Safety highlights include ISOFIX anchorage points (mounting fixture for two child seats on rear seat bench), Anti-lock Braking System (ABS), and immobilizer. With an SRP of only P686,000, the Santana provides the opportunity for more hardworking Filipinos like CW Home Depot’s sales representatives to experience the premium Volkswagen driving lifestyle, and motivating them to excel even more in their work. CW Home Depot’s sales representatives also get an additional advantage of a worry-free maintenance experience with the Santana, as the warranty coverage is comprehensive. Aside from the 3 years or 100,000-km general warranty, whichever comes first, Volkswagen Philippines also offers a 3-year warranty for paint and another 3-year warranty for through-corrosion of the main steel body structure. The periodic maintenance service (PMS) interval schedule of the Santana is also structured for its owners’ convenience. The PMS interval is once a year, or every 10,000 kilometers, whichever comes first. This is more convenient and more cost-efficient compared to the industry-standard 5,000-kilometer PMS interval, and thus also gives more time for CW Home Depot’s sales team to focus more on servicing their customers’ needs than on their vehicles’ upkeep. 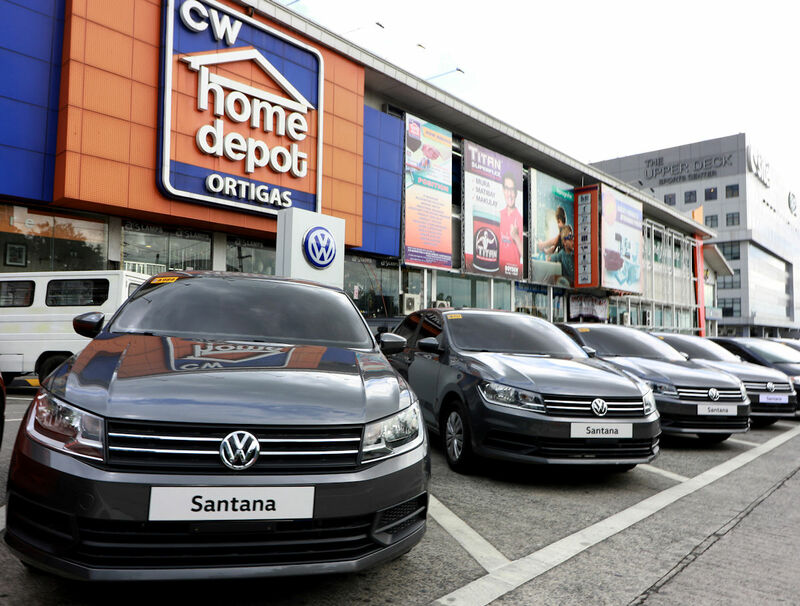 The 4 Santana units turned over to CW Home Depot represent the initial batch of requirements, as the top sales performers from the store’s 9 outlets will be handed their own durable, reliable, practical and fuel efficient Santana sedans. CW Home Depot outlets are located in Alabang in Muntinlupa City; Balintawak and Commonwealth in Quezon City; Santa Rosa in Laguna; Imus in Cavite City; Makati; Manila Bay; San Fernando in Pampanga and its pioneering branch in Ortigas.